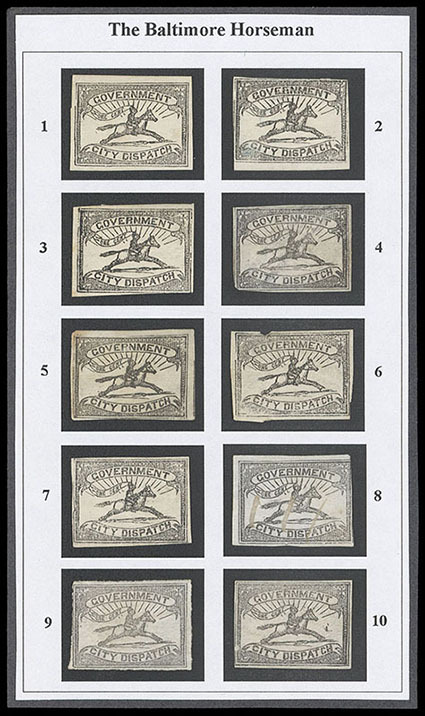 Baltimore, Md., 1857, 1¢ black, reconstruction of the 10 types including the varieties "SENT" for "CENT" (position 7) and "Short Rays" (position 2), most are unused, some small faults, generally Fine. Scott No. 1LB8 Estimate $200 - 300. 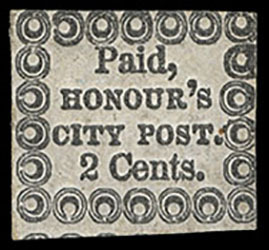 Charleston, S.C., Honour's City Express, 1851-58, 2¢ black on bluish, o.g., margins ample to just in, F.-V.F., a very scarce mint stamp with original gum. Chestnut Street Line, 1856, 1¢ black on pink glazed, affixed to small portion of cover, clear to large margins, creases and some surface chips, Fine appearance, only three examples of the Chestnut Street Line locals are known, two are recorded on cover, on pink and on yellow glazed paper, and this off cover example in pink; signed Geo. B. Sloane on reverse. 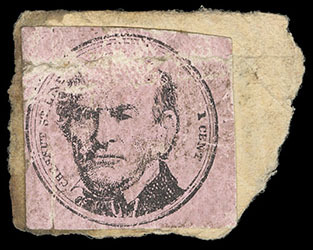 ONE OF ONLY TWO KNOWN EXAMPLES OF THE CHESTNUT STREET LINE 1¢ BLACK ON PINK GLAZED ISSUE. The Chestnut Street Line was a horse drawn omnibus that ran along Chestnut Street, and passed the Dock Street side of the Merchants' Exchange where the Philadelphia Post Office was located. According to Elliott Perry in notes he had prepared for Eugene Costales (when Costales owned the only known cover from this Line), the western edge of this omnibus route was near the Schuylkill River, about two miles from the Post Office. No record appears, however, of there having been a letter box located on the Chestnut Street Line, although there are records of other such traveling letter boxes on horse drawn omnibuses serving other, heavily populated sections of Philadelphia and its environs (e.g., in the Kensington and Southwark Districts). Perry argues that the convenience of having such a traveling receptacle should be obvious with respect to houses and businesses located along or near Chestnut Street, but which were not near the Post Office at Third and Dock Streets. 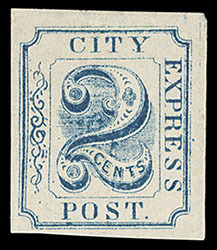 Adams' City Express Post, 1850-51, 2¢ blue, position 90, full o.g., ample to large margins, small thin at top, Very Fine appearance, a very scarce stamp, listed but unpriced in Scott; with 2016 P.F. certificate. Scott No. 2L5 Estimate $200 - 300. 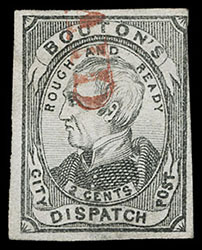 Bouton's City Dispatch Post, 1848, 2¢ black, neat red straight line "Paid" cancel, margins large to just touching frameline at upper right, F.-V.F., scarce. 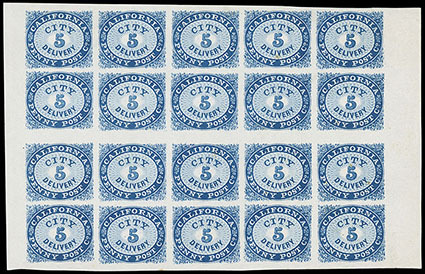 California Penny Post Co., 1855, 5¢ blue, sheet of 20 with two panes of 10 with interpane gutter between panes, without gum, large margins at top and bottom with full sheet margins at sides, tiny thin spot bottom right and light corner creases in right selvage not mention on cert, Extremely Fine, ex-Lilly, Boker and Golden; with 2007 P.F. certificate. Scott No. 34L2 Estimate $2,000 - 3,000. 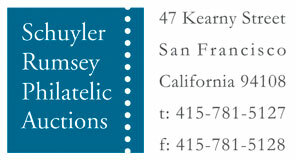 THE LARGEST KNOWN MULTIPLE OF THE CALIFORNIA PENNY POST 5¢ CITY DELIVERY ADHESIVE ISSUE. 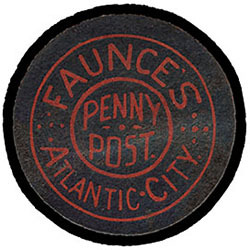 Faunce's Penny Post, 1885 (1¢) black on red, without gum, fresh and Very Fine, scarce. 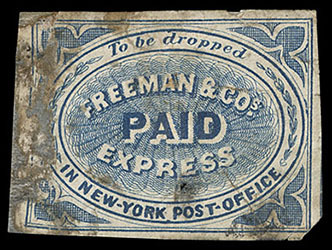 Freeman & Co.'s Express, 1855 (25¢) blue, without gum, appears at have cancelling ink at lower right, defective with sealed tears and strengthened paper loss at right, Decent Appearance, still an extremely rare stamp with only three examples recorded all which are faulty, this may be only used example known, ex-Dos Passos. 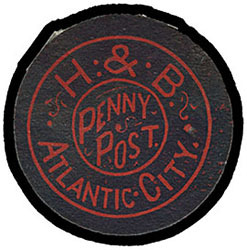 Hackney & Bolte Penny Post, 1886 (1¢) black on red, without gum, fresh and Very Fine, very scarce. 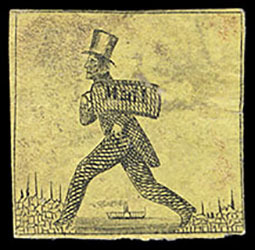 Hartford, Conn. Mail Route, 1844 (5¢) black on yellow, position 4, without gum, clear to ample margins, minute scissor separation cut at bottom right, otherwise Very Fine.